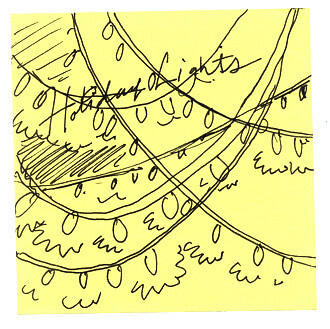 This was my first and very spontaneous sketch for the design of Holiday Lights. After a couple of failed attempts to improve upon the composition, I ultimately just decided to follow it exactly. Sometimes the first ideas are the best. A spontaneous sketch turned into a great design! My whole family was very impressed… and the songs really rocked. Thanks Lee-Roy! Thanks, Nick! Glad you and your fam enjoyed it!! !